Claire at Hyphen Magazine put out a call for Asian American immigration stories to "celebrate" the 20th anniversary of The Joy Luck Club. I put celebrate in quotes, because Claire says "although it was wonderful for people of my generation -- who were reaching adulthood just as Joy Luck was hitting the bookstores -- to finally see Asian immigrant families in fiction, the book also limited a generation of writers to a particular narrative." I read the book twenty years ago and I loved it for its rich storytelling of Chinese lore. I grew up hearing my mother's stories, but none of them involved mythical tales of ghosts and superstition. 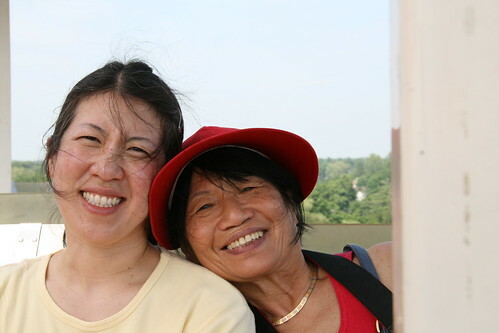 This story of my own family's immigration is from my mother's point of view. I tried to keep it to the 300 word requirement, so maybe someday I'll tell a longer version. Since my mother is getting older, I think she finds solace in telling me these stories and passing on her legacy. Check all the stories at the Hyphen blog. My parents Linda and John were both originally from China but moved to Taiwan when they were teenagers during the Communist Revolution. In Taiwan, Linda attended the prestigious Taipei First Girls' High School. Many of her classmates were well off and their parents sent them to the United States to attend college as it was fashionable to do so. 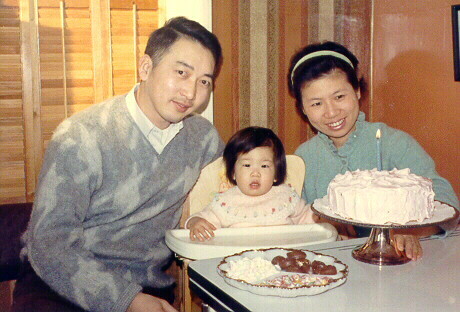 Her family didn't feel she needed to attend college in the United States, so she studied Chemical Engineering at the National Cheng Kung University in Taiwan where she met my father John. 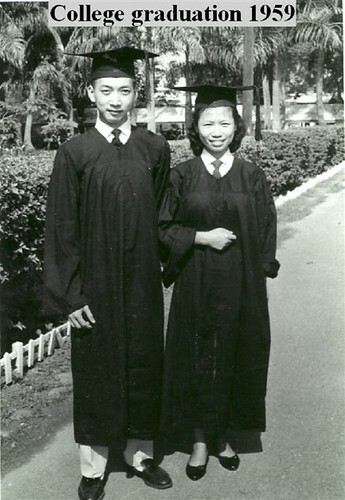 John and Linda graduated in 1959 and looked for ways to attend graduate school in the United States. They found advertisements in science journals for the University of North Dakota which offered full scholarships. They applied to the Chemistry department and were accepted, but had no money for air travel. Linda's father decided to give money to John for airfare in 1962. After a year, Linda was given the airfare to go. They often said that they picked North Dakota because they wanted to live someplace cold because Taiwan was so hot. In 1963, they married and in 1967 they had me. Since they were both in the midst of their PhD theses, Linda's mother came over to help take care of me. John's parents, who could not afford to travel, wanted to ship me back to Taiwan to be raised (egad! no offense, but I am way too American to imagine any other life). My mother would not hear of it and kept me in the United States after my grandmother left. She said the early days in the US were quite a struggle. They had to make ends meet on a stipend, learn to drive, and deal with Midwest discrimination. Even now, it is hard for my mother to realize that she no longer has to struggle and to stop and enjoy the present.